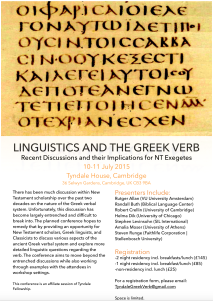 Linguistics and the Greek Verb Conference Announcement! I am very excited to announce “Linguistics and the Greek Verb: Recent Discussions and their Implications for NT Exegetes” — a Greek linguistics conference taking place in Cambridge, England, this July! The aim of the conference is to bring together NT scholars, linguists, and Classicists to discuss the Greek verbal system in a way that is clear and that moves the conversation forward while acknowledging and respecting the discussions of the past three decades within Biblical Studies. (If you would like to read the backstory of this conference, see my post “How We Got to Where We’re Going: A Story.”) I am incredibly excited about this conference. Not only will we have some phenomenal speakers from within the Biblical Studies guild, but we will also have the benefit of learning from Classicists, voices often not heard in Biblical Studies. via Language Log » François Mitterrand crash blossom. Here’s a piece that I just posted on our School of Christian Thought website at Houston Baptist University. I explore briefly what linguistics is, and why it is beneficial to study linguistics. Here at HBU we have a Biblical Languages program, which includes both an undergraduate degree in biblical languages (just Greek and Hebrew) and an MA in biblical languages (Greek, Hebrew, and Aramaic). One of the requirements that we insist on for both programs is a course in General Linguistics. As the Director of the MABL program, sometimes I am asked questions like What is linguistics? and Why is it important to study linguistics? In this post I will attempt to provide some brief answers to those questions.